← Essential Oils – Fab or Fad? 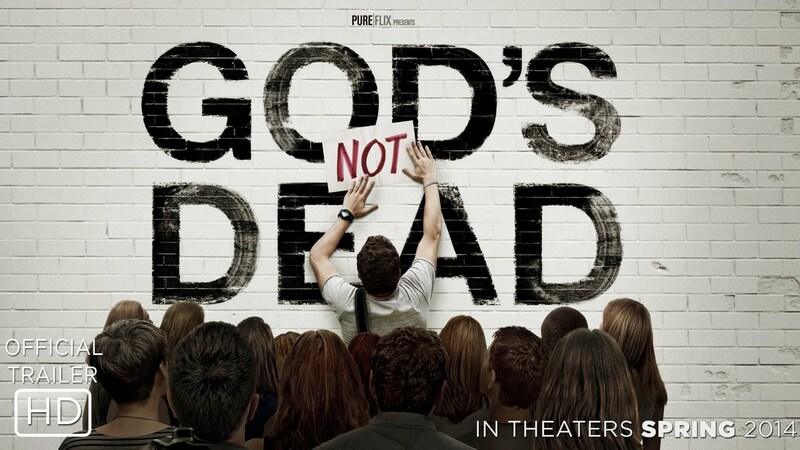 Last week, we went to see ‘God’s Not Dead’ in the theater. For the TLdR, I urge you to see it, with your teens if you have them. We took our youth Bible study group. If you are looking for a synopsis, this isn’t it. I want to touch on a few impressions, and mention things you might want to discuss with your family. There will be spoilers, so don’t read further if you want to be surprised. Overall, this is not a movie that is going to bring your friends to Christ. The apologetics are weak, and in the end our young protagonist wins simply by enraging his professor, showing that he does not, in fact, believe God is dead, but rather has a long festering grudge. Our young teens were cheering for every point made, but seriously, don’t take this stuff to school and try to convince your friends. Living a Christian life in the face of adversity is a much better witness, and more successful than arguing with someone set in their position. I felt that the real point of this movie was relationships. We see many, good and bad. Our main protagonist has a girlfriend. It seems they’ve been together 6 or 7 years (making them 12 when they got together?!? ), and she makes a point that she is attending his university for ‘them’, not because she wants to go there. She forbids him to stand up for his beliefs, despite being a person wearing a cross and enjoying the Newsboys. (As a side note, our girls mentioned her shirt, which was a little low cut and more form fitting) It doesn’t take long for our young man to stand up for himself and realize that she is being selfish. She huffs off, the relationship over. Huh. Another ‘couple’ is a businessman and an internet blogger. Her GPS is stolen, and she calls him for directions to her latest assignment (which is to aggressively interview a Duck Dynasty guy). His immediate reaction was, ‘What’s in it for me?’. Incredulous at being so confronted, she finally mentions that the interview will get her tons of hits on the site, thus generating revenue for her advertisers, one of which is this man. Later she discovers she has cancer, which has spread. They meet for dinner, him brimming about something amazing that happened. She tells her news, and his reaction is ‘Couldn’t this wait until tomorrow?’. And he dumps her, letting her know that it was always just a relationship of convenience for him. Finally, we have the Professor and Mina. Mina was a student of his (an undetermined time ago, it is unclear whether she is still in college). In fact, after the mid-term (where he determined she had a brain to go with her pretty face), he asked her out, which is clearly against the rules of the university. The age difference I can live with, there have been many May-December romances that have worked out. However, this situation of one person being in a position of power and prestige is a dangerous one. Mina bases her worth on being the prof’s girlfriend, and bends her beliefs to suit him. To top off this relationship, it turns out that he is an alcoholic. She debates long and hard about purchasing wine for the dinner party he was holding for faculty, and finally decides she has to. Some words were said, the professor was doing his own drunken showing off for his faculty friends, and Mina ‘quits’. There are a few other relationships of note. Mina goes to check on her mother, who has advanced dementia. She obviously loves her, but also doesn’t check in perhaps as often as she should. She urges her brother to visit before it is too late. He finally does, and in a moment of clarity she expounds on why good things happen to bad people. Then we have the relationships of two young people of other faiths and their fathers. The Muslim young lady has been hiding her faith in Christ for a year, her little brother finds out and tells on her….and father beats her and throws her out. They are shown crying on opposite sides of the door. The young Chinese man (Buddhist? or perhaps nothing at all) is shown contacting his father by phone about the things he is learning in Philosophy 101. His father is concerned that the conversation will be listened to by the government, destroying his sibling’s chance of attending college in the USA. Both of these brought up good conversations, and are reminders that we aren’t always ‘free’ to believe what we like. It may cost something, and it may be dear to us. Finally, there is the relationship between the pastor and his missionary friend. This was the comic relief of the movie, but with a message as well. They had planned to take off on a road trip to Disney, but at every turn the vehicles didn’t work. Over and over, the delays allowed the pastor to tend to his own mission field. (He had been longing for the excitement of overseas missions.) Yes, it was cliché, but seriously….if you are in the circumstance, do you always see God’s hand in it? Even pastors miss it. Another point to bring up is peer pressure and group think. In the beginning, the class doesn’t think much about signing that paper, as doing so would get them out of work, and the professor said they should do it. And everyone else was doing it, so go with the flow. In the end, it seems the student is not going to win over the class in the debate, until one student stands up….which encourages another, and finally nearly the whole class is on their feet. Was it suddenly a room full of Christians? Not hardly. Lots to discuss here about the call of conformity, and the power of one voice in the wilderness that can break that barrier. And how much work there is to be done even after minds are opened. Overall, I think the movie was worth seeing. We had some great conversations about what love is and isn’t. We talked about faith having a cost, and for some the cost is greater. We learned a bit about compassion. Yes, the movie is totally a Christian cliché. It’s ok. This is a safer film to take your family to (I would say 13+), and spark conversation about topics that sometimes don’t come up as we are shielding them from popular movies and television. As our young people get older, we need to equip them. We do them no favors releasing them to the world unprepared. Use the opportunity.